For the record, China is a country with more than 4,000 km of coastline in the South China Sea. Under international law, it is entitled to claim an exclusive economic zone (EEZ) of 200 nm from the baselines of its territorial sea. On a rough estimate, it is entitled to around one million sq km of EEZ in the South China Sea based just on its mainland coast and the coast of Hainan Island. A country’s international law claims to territory or maritime jurisdiction are only those articulated by its government in a formal manner. Beyond its South China Sea coast and Hainan (and minor islands close to these coastlines), and associated territorial sea and contiguous zones, China’s claims in the South China Sea have the following elements. A claim to Pratas islands which is identical in character with the claim of Taiwan, Vietnam and the Philippines. A territorial claim to the Macclesfield Bank, a small submerged featured known in Chinese as Zhongsha Islands, which does not qualify as land territory under international law and cannot be subjected to territorial sovereignty. Of these, only the claim to Macclesfield Bank would not be in conformity with international law. Otherwise, China’s claims to territory are nor more or less preposterous than those of Vietnam. Based on research for my 1998 book, China’s Ocean Frontier, I have concluded that China’s claims to at least some of the islands are less preposterous than those of Vietnam and the Philippines, but that China’s claims to the entire Spratly group are probably not, in respect of each and every natural island, superior to those of other claimants. One unusual problem about sovereignty claims in the Spratly Islands is that Taiwan, a political entity not recognized as a state, is an active claimant. This is further complicated by the likely implication that states which recognize Taiwan as part of “one China” are probably obliged to recognize Taiwan’s territorial rights as also adhering to “one China,” although that entity has an indeterminate status in international law. A 200 nm EEZ jurisdiction from the baselines of its land territory in full conformity with international law. A claim to continental shelf jurisdiction from its land territory in full conformity with international law. In addition, China has used the so-called nine-dashed line enclosing almost the entire South China Sea on many official maps since 1947 but it has not yet decided what, if any, legal force to ascribe to it. If it did ascribe any legal force, that would not be compatible with international law (verging on “preposterous”). Chinese officials have from time to time referred to China’s historic rights within this area but have not clarified what these might be beyond the territorial claims. The only possible historic right China could claim compatible with international law would be related to traditional fishing in another state’s recognized economic jurisdiction. On balance, it is hard to see how Admiral Harris would justify use of the undiplomatic term “preposterous” in respect of the China’s current claims in the South China Sea. He may be justified in using it (in private) if China did go ahead and claim legal force of any kind to the u-shaped line. China went close to this (being “preposterous”) by including the line without any explanation or discussion in a sketched map attached to its submission on the extent of its claimed resource jurisdiction on the continental shelf which it submitted to the Commission on the Limits of the Continental Shelf. Since the line bears no relationship to the legal criteria outlined in the required submission, it would only be fair to leave open any suggestion as to what it means. The State Department made plain in December 2014 that “China has not clarified through legislation, proclamation, or other official statements the legal basis or nature of its claim associated with the dashed-line map.” The Philippines has brought a case against China in the Court of Arbitration to seek clarification of the Chinese intent behind the dashed-line in that submission. It is now widely known that the nine-dashed line was first used (in a slightly different form) in a map released by China in 1947 (before the Communist Party came to power). What is not widely discussed is that the Chinese move followed by less than two years the Truman Declaration in which the United States broke with pre-existing international law by claiming resources jurisdiction in the seabed of the continental shelf beyond the territorial sea. Perhaps China in 1947 was staking out a similar claim as other states rushed to emulate the revolutionary and expansionary U.S. claim. Sources in China close to the government say that it has been unable to decide what to do about this nine-dashed line left over from history. Some constituencies in China have argued that China has “sovereignty” over all of the sea areas enclosed by the line, but the government has not endorsed this view–ever. So it has become a sensitive domestic political matter in which leaders face the accusation of being a traitor if they surrender the line. Such a charge has been publicly levied by Chinese hawks against former President Jiang Zemin for his border agreement with Russia. At the same time, there are more than a few Chinese official statements that appear to limit China’s claims to maritime resource jurisdiction to those embodied in the Law of the Sea Convention. Admiral Harris also characterized China’s land reclamation activities as “preposterous.” By contrast, it should be noted, China regards these reclamations as examples of its “great restraint.” What significance should we attach to the reclamations? Between 1987 and 1996, the PRC occupied eight features in the Spratly group. These included Fiery Cross Reef, a totally submerged feature where the PRC in early 1988 conducted major engineering works to construct an 8000 square metre platform of concrete and steel rising two metres above the sea. It erected structures on Cuarteron Reef, Gaven Reef, Subi Reef, Dongmen Reef and Johnson Reef in 1988 and 1989 and on Mischief Reef in late 1994. 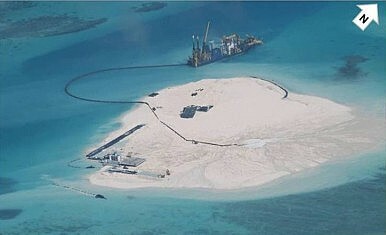 In September 2014, when new construction was revealed on Johnson Reef, a Chinese commentator echoed the Foreign Ministry by saying that the country needed to improve facilities there to make the lives of its occupants easier, but he added that China also needed an airbase to prepare for emergencies. He noted that this would be a breach by China of the 2002 Code of Conduct but that Vietnam and the Philippines had consistently breached it, and that China had shown great restraint by not using force to evict their forces form the islands and submerged features they occupied. On 9 April 2015, as CSIS in Washington observed, China acknowledged for the first time an unspecified military purpose to the reclamations. It is hard however to credit the extreme view published by the Center for Strategic and International Studies (CSIS) that a 10,000 ft. runway that China appears to be building on Fiery Cross Reef “could enable China to monitor and potentially control the airspace over the South China Sea, which would provide greater capability to exert sea control.” This to me is hypothetically possible (in terms of monitoring) but preposterous in terms of practical realities (controlling all South China Sea air space from one reef airfield against the might of the United States and its allies). This sort of overblown assessment reflects the mood in Washington and in U.S. Navy circles that borders on rage at what they see (mistakenly) as China’s destabilization without any willingness to consider that actions of Vietnam, the Philippines or the United States itself might be contributing to the instability. The Philippines has expressed concern in 2015 that China may be planning reclamation activity in Scarborough Shoal, an underwater feature that China took control of in 2012 after repeat confrontations with Philippines vessels. The propaganda tactic being repeatedly used by those who see China as the only provocateur is to blur complex matters of law, dates and sequencing of events to paint China in the worst possible light. China is not blameless but the hysteria coming from the anti-China camp might be seen as laughable were it not so serious. It has been well summarized by a Chinese commentator in 2014: “Manila and its Western supporters have a rather ludicrous logic that the Philippines and Vietnam can do anything on the Nansha [Spratly] Islands and China can’t take any countermeasures.” The U.S. State Department position has consistently been relatively measured and restrained. It needs to reassert some control over PACOM’s public diplomacy. But this is not simply an institutional coordination problem in Washington. It is a serious intelligence failure on the part of the U.S. Navy leaders in the Pacific. They are expert in the Law of the Sea but they have far less expertise on the law of territorial acquisition and sovereignty. The Pentagon, and PACOM in particular, have appeared on too many occasions deeply inexpert or biased on China. In public and in private, PACOM officers too often rush to ascribe the most silly intentions to China without offering any sort of reasoned and empathetic assessment of how the Chinese might see the problem. A new and more empathetic study of the issue from the United States government might also evaluate the reliability of the repeated reassurances from Chinese leaders that their activities in defence of the Spratly claim represent no threat to international commercial shipping. The U.S. intelligence community is capable of such a balanced study. It may exist already. The world would be a safer place if it could see such a balanced study by the U.S. intelligence community in the public domain. More FONOPs Coming Soon to the South China Sea?Which South China Sea Island Holds the Greatest Military Significance?A Military Game of Chicken in the South China Sea? Right and Wrong on the South China SeaWho Is the Biggest Aggressor in the South China Sea?